NEW YORK -- One of Mayor Bill de Blasio's top aides committed a serious offense in the eyes of New Yorkers. Eric Phillips is de Blasio's press secretary. 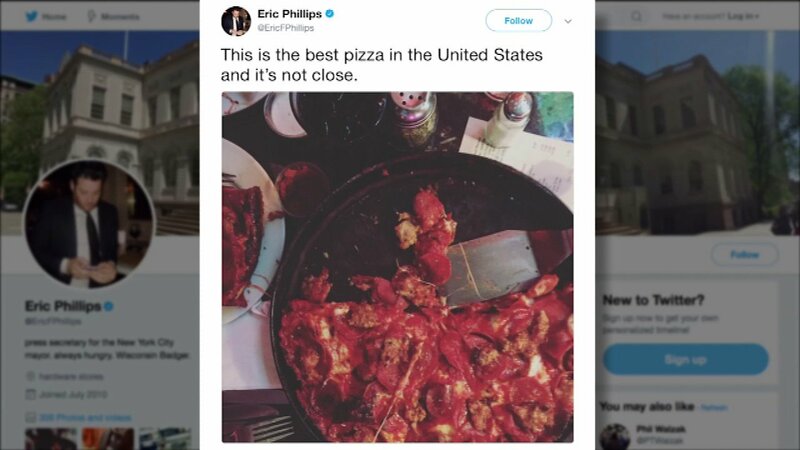 One of his recent tweets, featuring a photo of a pizza from Pequod's in Chicago, sparked a frenzy on Twitter over whose pie is the best in the nation. New Yorkers started slamming Phillips, who is originally from Wisconsin. But Chicago Mayor Rahm Emanuel agreed, tweeting, "Confirming what everyone already knew, sorry." One New Yorker said people need a nap after a slice and a half of Chicago pizza.